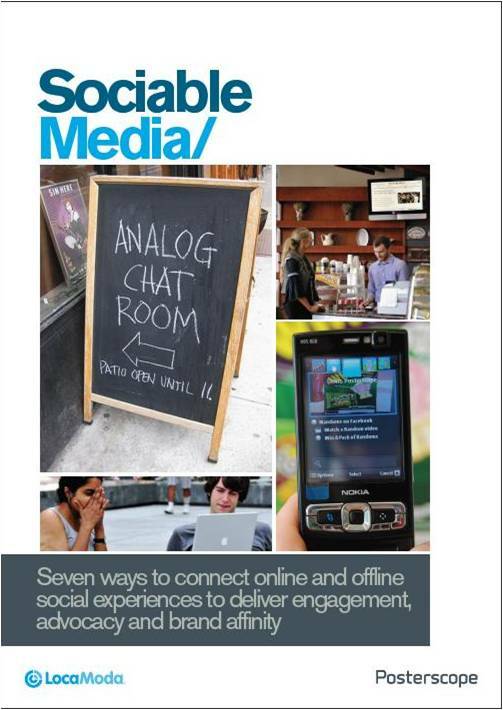 Posterscope have partnered with technology pioneers LocaModa to produce a paper entitled ‘Sociable Media : Seven ways to connect online and offline social experiences to deliver engagement, advocacy and brand affinity’. Click here to download a free copy of the paper which explores ways in which brands and agencies can move from just talking about mobile/social/OOH convergence to actually incorporating it into campaigns. Live streaming of data, images and even video to and from digital OOH screens is becoming increasingly popular but this campaign for Nike in Argentina adds an interesting twist. Consumers are invited to blow onto the microphone of their computer (or onto a point of sale display computer in a Nike store). This blowing action then moves a shoe that is floating on jets of air in Argentinean store. Giving consumers the opportunity to take part in something with minimal effort when OOH as an alternative to the online option is a good way of extending the appeal of this kind of activity. Public artists, Greyworld, and mobile specialists Marvellous have created an interactive display for Nokia that allows people to blow on their Nokia smartphones to create artwork on a large OOH screen.